I suddenly feel the need to explain myself to the horrified bibliophiles out there. Let me just say that I long ago got over my guilt about cutting up certain old books. My justification, should you be interested, is that I work with these chosen victims the way sausage makers work with a pig – they use everything but the squeal. But let’s get that unpleasant image out of our minds and get back to my story. Actually, it was one Margaret Deland’s story, a 1906 novel she called “The Awakening of Helen Richie” and saw fit to populate with more tormented characters than I’ve ever found between two covers. 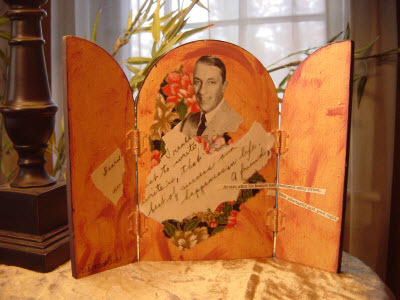 Along with Margaret’s fine prose I chose to use pieces of a charming old autograph book from my collection as well a picture from a 1950s magazine of a suitably smarmy young man. While I’ve harvested bits of dialogue and narrative far more dramatic and florid than this particular one, Margaret’s depiction of this poor sap (with his high hopes but low probability of ever scoring) spoke to me of every unbearable, glacial evening anyone’s ever spent in the presence of the relentlessly boring. Zesty Artista ~ Adornments and inspiration for a luscious life. Welcome to Zesty Artista, a quirky little source of adornments and inspiration for you, your home and your luscious life. You’ll find a gallery with some samples of my work, my etsy shop where you can buy yourself or someone else a little something, and the Zesty Artista blog, which is where I share ideas, great finds, interesting people, and various tidbits at least tangentially related to having a great big, juicy, luscious life. Thank you for stopping by. I hope you’ll find something that tickles your fancy.